Deze tekst hebben we ooit gemaakt voor http://www.indiamike.com, omdat er nauwelijks praktische informatie te vinden was over reizen met kinderen in India. Het reisverslag vinden jullie hier: India 2005. Het jaar daarna gingen we weer naar India, dat verslag staat hier: India 2006. 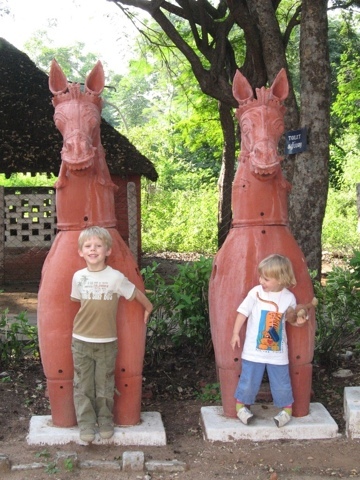 Travel with (young) children to india is fun and just slightly more challenging than a package holiday to Spain. This article tries to help with all the preparations, with advice on health, luggage, transport, food, costs and activities. You’re kids will most probably love it, so take a deep breath and go for it! Why go to India and take the kids? Why not? Just like Everest, the fact that it exists is reason enough. We visited India before the kids came. We gathered 3 and 5 years should be old enough, but also considered a trip to India a bit more challenging than a week in the French countryside, so we started collecting information. We did not find a lot of specific information on travel with small children in India available, but we got some useful contacts and tips via Indiamike.com. This posting is based on our own experiences during both our trips to India in 05/06 and 06/07, advice given by Indiamikers Nick-H (well mrs H.), STEVEN_BER, Gayamom, Baysab and BRYAN, tips picked up from IM and tips from our driver Gandhi, Jenny and Jose in Ernakulam, Faith from the travel agency and Govind from Jodphur. It’s a work in progress so, please feel free to contact us with any comments or additions you may have. This article was last updated in January 2008. The full report from our trips can be found in the community section in our journal . Any trip to Asia will be much more fun with some preparation done, but this certainly is the case when taking kids. Our first trip with the children was to be our fifth (Hans) and third (Mirjam) trip to India, so we knew a bit what to expect. As Steven put it: “if you have no experience of India, DON’T take a child, India is not just another country it’s another world, you need to know what you are letting yourself (and your child) in for”. We agree with him. Consider the effort in relation to length of the holiday / travel. A holiday of less than a month with a young child (under the age of 8) may not be worth the potential risks, but this depends largely on the kid. We found this out ourselves. Our first trip was one month and had a nice pace. The second trip lasted just two weeks and we had to rush too much. How is your child going to react to a long flight, a ‘mad’, busy airport with strange ‘brown’ people everywhere talking in a funny language and “why does he keep moving his head like that, mammy?” or people shouting ‘rickshaw, taxi, hotel? The heat, smell, chaos that is India? The poverty, jetlag, people doing ‘funny’ things with old teapots? How are you going to answer all these questions? Another good idea to do at home, for a couple of weeks, every single thing you do with/for your child, or everything your child does, think how you/child will do this in India, EVERYTHING. The Lonely Planet (LP) ’Travel with Children’ book is a good start, although a lot of room is unnecessarily spent on descriptions of countries. http://www.lonelyplanet.com (including the thorntree forum) and http://www.roughguides.com have useful information, and we got some nice tips from the rec.travel.asia newsgroup. http://www.indiamike.com proved to be especially helpful, as it focuses on India and therefore there is not a lot of clutter compared to other more general websites. Let’s start with a disclaimer; the internet is not meant for individual health advice, so everything written here is not meant as specific advice and should not replace the advice of your own physician. It may help you to have an informed discussion with your GP. If your GP is too general seek advice from a specialist, e.g. someone at your national centre for tropical health, or some place like that. Always seek your physician’s advice before making decisions for you or your family. Having said that, children’s health is at least a latent concern for parents all the time, but it seems to become crucial when planning to go to India. If you’re not concerned, be sure that almost everybody else around you will remind you of all the real and perceived dangers. The hazards are manageable though. Make sure everybody is inoculated for Diphtheria, Tetanus, Polio, Typhus, Hepatitis A and B. Consider inoculations for Measles, Mums and Rabies for the kids. If the region you plan to visit has had a recent outbreak of Japanese Encephalitis or the plague, go somewhere else. As for malaria: Malaria kills! Both P. vivax and P. falciparum remain endemic in India. Morbidity and mortality are highest in young children. Prevention is the key, so prevent being bitten using long-sleeved clothes and bed nets after dark. Use mosquito repellent. DEET-based repellants need to be used with caution in those under age 2 — please ask your travel clinic for specific advice in this regard. Mefloquine, atovaquone-proguanil or Proguanil hydrochloride (Paludrine) are at the moment the recommended agents for malaria prophylaxis. The dose varies by weight. Ask your physician. There is no profylaxis for Dengue, so this is an extra reason to keep body parts covered. Your child may find it difficult to sleep away from home with the new surroundings; they may find it more difficult than adults to adjust their ‘body clocks’. By the way, ours didn’t. When we arrived the parents were thoroughly jetlagged, the kids were fresh to go. If you have a young child, it would not be a good idea to leave them with a child-minder, ‘first signs’ are an essential indication that all is not well with your child, the best signs that all is not well are probably; a change in the smell of your child’s urine, a change in the look of your child’s eyes, an unexpected mood change, all these things will be naturally spotted by you, but not by a child-minder. Toddlers have a habit of picking things up off the ground and putting it into their mouths, (we were all a lot more healthy when we ate mud and worms) its frightening to imagine what they might put in their mouths in India. We trained our kids to wash their hands a lot more than we normally do (yeah we know you should always etc…, but sometimes these things just don’t happen). We even started brushing teeth out of a bottle before the last few weeks for the holiday. Take some antibiotic hand wash with you for your washing hands …very useful. Children are naturally very active, dehydration in hotter places could be a problem, though bottled water and fruit is widely and cheaply available, some re-hydration salts would be useful. Keep a leisurely pace, build in a couple of hours of relaxing in the hotel room at lunch or teatime. Remember, a punishing schedule trying to see everything in a short space of time is hard enough for adults and for kids it can turn a fun experience into a nightmare, especially in the hot sun. Try and stop in places to allow your kid to get some grounding, moving every couple of days doesn’t allow the kid to chill and play and becomes a negative experience. Drink bottled water (available everywhere). Keep your hands clean and don’t pick your nose (brings the bacteria straight into your system). Do not pick up stuff from the streets. Wash your hands before eating (or use disinfecting wet tissues; also good for cleaning feet after temple-visits). Always put on hats and sunglasses. As a general precaution take multivitamins every day. Wear sturdy shoes, no sandals. Check feet on cuts after temple visits and disinfect if necessary. Never eat anything from a stall / cooked in the streets. Stay away from buffet-style meals. Eat in busy restaurants. Buy a small anklet with a bell and put it on your kid, you’ll hear him around even when you’re not watching. Use mosquito repellent. For hotel rooms we bought and used the Bayer electrical mosquito coils. Donate small amounts of money to a Temple once in while and pray to the gods on a regular basis. Have Imodium ready anytime. All tablets, medication, should be bought in your own country, Although a lot is available in India over the counter, also a high percentage of tablets in India are ‘fake’. Adults may take the chance, it’s a lot more dangerous for a child. During the day always have suntan lotion and a medical kit in your day pack. Tripelennamine HCL (Azaron) relieves itches from mosquito bites etc. Food is only a problem if you make it a problem. Don’t think your kids will eat Indian food, because you also cook it at home. It will be spicier and hotter in India. Simple food such as indian bread (all kinds), eggs, plain rice, fresh fruit, toast, curd are available in most places. Cornflakes can also be found. Always good to have some crackers or biscuits with you. You can also ‘stew’ some fruit (apples, pears etc) for desert, kept in a fridge in an airtight container, both dishes should be good for the following day. For the rest ‘Fish and Chips’ and Pasta are the main features on any ‘western’ menu. Our kids survived on it easily, with the help of some multivitamins. Older children; Pizza and McDonalds and er.. more pizza and MacDonald’s. Breastfeeding is a hugh advantage for nutrition, as well as for calming, putting to sleep, flights and general adjustment. Indian women will take the opportunity to breastfeed when going by auto, or maybe by train or bus. If a woman needs to feed her baby on the bus, other women will find a seat for her and surround her. Any man stealing a glance will be scolded: Hey, Go home and look at your mother or sister if you dare! You think she’s got anything they haven’t? Hey! You can’t go home and look at your wife? Thus is the fellowship of Indian women! And yes, everything goes on under the folds of a sari. So as a tourist you’re not in uncharted territory. You will attract some attention though, be modest, find a quiet corner where possible and use a big shawl or saree to cover the interesting bits. Be happy, because you’re able to provide your baby the best food available in the world. Getting around, some people can take 8 hours squashed in a hot bus and being thrown around, but it would be a lot harder for a child (or parents worried about their child). Trains are a lot better, but often slower and sometimes difficult to book. The internet has changed that though and you can now make bookings up to two months in advance via http://www.irctc.co.in. If you can afford it hire a car for the day, the city, or the whole period. An Ambassador car with aircon will cost you about 30-35 Euros per day (40-45 US dollars) including taxes, driver fees etc. Pushchairs, all but the most rugged 3 wheel pushchairs would be a waste of time, I wouldn’t take a pushchair, the streets can be too chaotic and when there are pavements they are normally uneven and have big holes in them, also, in India the pavement is often used for overtaking, for a baby a ‘baby carrier’ that straps onto your back or front would be a better option, for a toddler a set of reins would be useful. Naturally a visit to Indiais not complete without all these other wonderful forms of transport like Rickshaws, Elephants, speedboats, backwaterboats, Camels, Buffalocarts etc. Try to use them all! India is a cheap country by any standard, but travelling with the kids certainly will make it a bit more costly. Wahtever you spent before, (qua)druple it! For comparison; in 1997 we spent about 35 Euros a day during our seven week honeymoon in India. In 1998 we spent 25 euros a day during a trip to Nepal and Sikkim. Nowadays our daily budget averaged 120 / 130 euros. From this amount we spent about half on accommodation, a bit over 25 % on a car plus driver and the remainder on food, drinks, entrance fees, souvenirs, tips etc. . Especially the accommodation cost a lot compared to what we used to spent, but we were with four now, we spent more time in the hotelroom and wanted cleaner and more spacious accommodation. India is still the place where a two room suite is affordable, and having two rooms gives you the possibility to be a couple beside a couple of parents. Getting cash is not a problem anymore. We used our creditcard for paying the car and some hotels. We used our normal banking cards to get cash from ATM’s, that are now abundant. Like almost anywhere in Asia (and the world), tourists are overcharged in India. Two simple rules apply: ask prices before you order anything and bargain for everything. It will make your stay a lot cheaper. Make sure you buy enough while in India. This may sound silly, but first time around we just were more focussed on other things. For keeping memories it’s great to have Indian things in the kids rooms (and your own). Whatever you spent it will not be a lot compared to the cost of travel. So stock up in the government emporiums before you fly back (e.g. the comvenient row in New Delhi). You’ll be amazed what you can buy in a couple of hours and the kids do love shopping, if they are involved (meaning getting to buy stuff they like). Travel with young western children attracts a lot of attention. This is in general not meant in an unfriendly way, but at times it would get a bit annoying for the kids. What was really a nuisance is everybody trying to pinch the kids in the cheek. “NO PINCHING” were English words our kids learned really quickly. Mum and dad would support this by warning of the attacks and by pinching back if necessary. The kids also didn’t like posing for photographs. If requests for a “picture with the baby” are too much – Just say NO. This may be annoying; the real danger lies in the traffic. The roads in Indiaare extremely dangerous and drivers do not always care too much about anything walking on the sides. There is no way you can let go of your kids once you are in the streets. Temples and parks are great for some physical exercise and the locals did not seem to mind our kids running around temples shouting Ayappa. Another annoyance is the air-pollution; a car with air-conditioning is absolutely necessary to keep most of the dirty air out. Be aware of the hazard of falling from a balcony or even from the side of the road down on the mountain slopes. The Indians are not too good at thinking safety. Check rooms and windows / balconies carefully. Improvised electric wires are also common, as well as High-Voltage cables on roof-tops etc. Take a roll of own isolation tape and use it where necessary. Post scans of your passports, visa and health insurance certificates to your web based email (hotmail) address. If something gets stolen or lost, you have the copies available in any internet café. In general we think people in South India are a lot more friendly and relaxed than in the North. On the other hand, the more relaxed you are yourself, the more friendly responses you’ll get, in the north as well as in the south. If someone wants to take you to his shop (hotel, sister, wedding, festival, home) and you don’t want to join him, be firm in keeping the direction you were going in. Try to talk to them about other things; even touts can be fun to chat to. Have a good think about what clothes and shoes your child will wear in India, and think about the effect the heat (or cold), humidity, monsoon, sun will have. Bring your own disposable diapers – Indian ones are not so good. If you are going for a long time, consider washable ones (environment friendly), or letting the baby hang around naked (great in Goa). Colouring books, pencils, soft tip pens, some small cars, Lego, small Playmobil puppets. Water, softdrinks, nibbles, cookies (if you’ve ever spent 6 hours on an Egypt Air plane on the tarmac in Hurghada without drinks, you bring your own). In our moneybelts: Passports, credit cards, ATM cards, some cash (Euros). Try to do everything (well almost everything) what you did in India when you did not have kids. Meaning basically that there will not be a lot that is not interesting, whaytever there age. A temple may be great for it’s religious value, but can also have funny statues or be great fro running around. Try and bring historical sites to life. Do some background history research and bring it to life. All kids love a story of kings, queens, wars, love and loss. It will make the experience all the more enriching. If you don’t know the real history of the object, make it up. You must have some imagination,. Otherwise you would not be in India with the kids anyway. Whatever your religion allow your kid to explore the temples. Let them do puja with the sadhus, It’s really beautiful. You’ll find lots of western and Indian kids to play with and language is rarely a barrier. Most cities large towns will have an attraction for kids, i.e. play parks etc. While waiting for dinner the kids can make drawings for the staff. Both parties love it. Take board games books and a few toys. It’s easy to find English kids books and toys are a plenty, refresh their collection every once in a while and let them give the old ones to street children. It will give them a good lesson in the value of what they have. If they are not reading English, the longer your trip is planned for, the more books you should bring, as it gets boring for the child to be offered the same thing over and over again.